Irish Figurative Artist, Portrait Painter: Contemporary Realist Style: Biography, Paintings. Although a master of both landscape and figurative works, Tomás OMaoldomhnaigh is chiefly noted for his portrait art, which forms the basis of his thriving practice. He has been a professional artist for many years, and his paintings hang on the walls of many of Ireland's top corporations, like Bewleys, Halifax Insurance, Pfizer, SmithKline Beecham, Wyeth, and others. Having exhibited widely throughout Ireland during his career, he now spends most of his time working on commissions, although he continues to show in both solo and group exhibitions across the country. His unique brand of representational art is represented in numerous art collections in the United States, Europe, Australia and Africa. In addition to his painting, he is also an outstanding illustrator in watercolour and other media, as exemplified by The Book of Clare, a captivating Impressionist journey through the banner county. Born in Limerick, O'Maoldomhnaigh spent much of his childhood drawing and sketching with pencils, crayons and charcoal. As his family had a number of small boats on the edge of Limerick City, his usual subjects were ships, boats, water, people and buildings by the shore. Gifted in both technical drawing, and several forms of art, he was accepted to Limerick Art College but never attended. He went to work instead. Looking at the outstanding works he has produced, exclusively through his own talent and hard work, one wonders just how far he might have gone if he had received a classical training. As an artist, O'Maoldomhnaigh works in a wide variety of media including oils, acrylics, watercolours, pastels and conte crayon, but his principal focus is portraiture and figure painting for which he favours oils. To hone his painting technique he also produces still-life studies and pictures of local people. As one might expect for an artist devoted to classical realism, O'Maoldomhnaigh is influenced by the great traditionalists like William Orpen (1878-1931) and Sean Keating (1889-1977), as well as the Impressionist portraits of John Singer Sargent (1856-1925). His daily painting habits revolve around his busy schedule of portrait and corporate commissions, which keep him confined mainly to his studio. When doing portraits, he first takes a series of photographs of the sitter, from which he makes preparatory drawings. This reduces the need for lengthy sittings. Additional consultation takes place during the actual painting process, to fine-tune the picture. 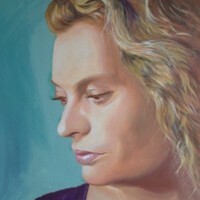 O'Maoldomhnaigh's portrait fees start at €500 for smaller sizes, €800 for medium sizes, and €1,500 for larger sizes. See his website (below) for more information. In addition to his portraiture and other private commissions, O'Maoldomhnaigh is a fine exponent of illustration. On his website you can find details of one particular book - The Book of Clare - which is a collaborative effort between himself and the writer Daniel McCarthy. It contains 32 watercolour illustrations of buildings, monuments, streets, houses and landscapes throughout the County, from Merrimans Country to Kilkee, and from Bunratty Castle to Black Head. Each illustration is accompanied by an explanation about the people or customs associated with the area. O'Maoldomhnaigh's corporate work includes a variety of special commissions, all made to order, including paintings of company plants and operations as a monument to what has been achieved. As well as decorating corporate areas, they are typically used on Annual Reports, brochures and even Christmas Cards. His paintings are currently exhibited in: the Bad Art Gallery Dublin, Lahinch Gallery County Clare, Bold Gallery Galway, and Huguenot Gallery Laois. O'Maoldomhnaigh lives and works in County Clare. A highly professional and sought-after artist, both here and abroad, O'Maoldomhnaigh is a perfect example of real talent finding a natural following among the public as well as public and private corporations - an outcome that many contemporary artists have yet to achieve. His paintings have much greater impact than is suggested by the small-scale imagery on this page, so I urge you to visit his website. Review written by Neil Collins (Editor) (August 2008). For a new way to buy works of art, like painting and sculpture, from unknown or emerging contemporary artists, see: Art Party - for Collectors.  For more about contemporary visual artists, see: Homepage.